I’m being a bit lazy today, so let’s talk about lazy time entertainment: cell phone games. I happen to own an iPhone so I will be discussing some of my favorite titles for that platform, but I don’t want to narrow the discussion just to iOS games. Android has a lot to offer in the gaming department too so if you would like to mention some ‘droid exclusive stuff in the comments please go ahead. When discussing phone games, it is probably a good idea to keep in mind that these things are played differently than the PC or console equivalents. When I launch a game on my PC I usually expect to spend at least 2-3 hours playing it – sometimes even longer. Regular video games are played in long, uninterrupted sessions and are designed to hold the users attention for a while. This is not how I play games on the phone though. My phone is my distraction when I’m on the go. I don’t sit down to play a game on it – I play games on it when I’m bored, and I don’t have access to a real gaming machine – for example on a train, in a waiting room of some sort, etc. Phone games are played in short bursts – 10-15 minutes at a time. It is quite rare for me to waste more than 30 minutes on these things in a single sitting. As a result, I find that iOS ports of PC style games don’t really appeal to me as much as they should. I downloaded a number old school, turn based RPG titles. I believe one of them was called Undercroft and looked quite promissing. Too bad, I never really got much further than the character creation screen. The gameplay was just too involved an I had no patience to put that much attention into a phone game. Same thing happened with a port of Sim City – I thought it would have been a fun distraction, but I hardly ever play it. It requires too much of a time investment to actually get a city going and I usually only have a few minutes to spare. Even ports of games that can be played in bursts, like the new Street Fighter don’t do that well on the platform. While I love old school fighting games, I find it really difficult to play them with the fuzzy and inexact touch controls that offer no tactile feedback. Part of the joy of these games is nailing down the exact combo moves, and that’s more or less impossible on the iPhone – the controls were just never built for that kind of precision. The platform lends itself more to puzzles and arcade style games with simple control schemes – time wasters, that were previously the exclusive domain of the Flash gaming scene. It’s sad but true. 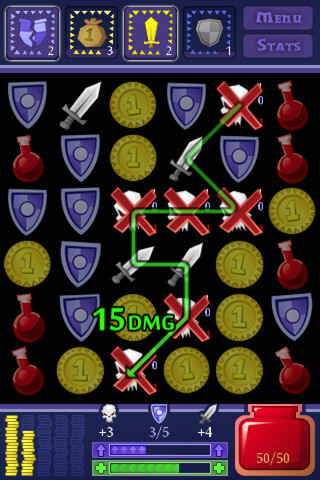 On the surface Dungeon Raid is just a simple grid based connect puzzle. You basically match up items of the same type, and if you can draw an nu-interrupted line through them (like shown on the screenshot here) you eliminate these items and more tiles slide down from up above. This game however has an RPG twist. You have a hit point bar, and some tiles are monsters (skulls) that deal damage as long as they are on the board. They can be damaged themselves by matching them with sword tiles (more swords, more damage). The health potion tiles replenish your hit points, and coins can be used to purchase upgrades (progressively better armor, more damage, regeneration, etc..). Killing monsters also earns you experience points which can be used to purchase skills that let you do interesting stuff to the tiles (like damage all monsters at once, turn all swords to coins, etc..). While the game play is really simple, the replay value is great since the skills that become available for purchase are randomized and you rarely end up with the same set forcing you to adopt different strategies on each run. The game also has unlockable classes that come with advantages and disadvantages that subtly influence game play. 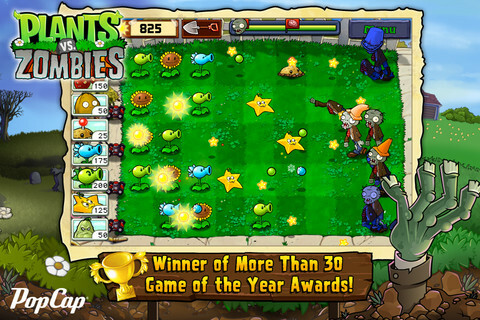 Plants vs Zombies is a port of the popular console title that swept the world few years ago. I think it exists on just about every platform out there, and seems to provide the same amount of entertainment regardless of the control scheme or screen size. At the code it is a classic tower defense game. You plant different types of flowers and vegetables that shoot seeds, explode or block incoming waves of Zombies. Your mission is to prevent them from reaching the house on the far left side of the screen. The interesting part is that every few missions the game breaks up the flow by introducing a new game mode. So unlike say “Angry Birds” where you just launch birds all the times, in PvZ sometimes you play whack a mole round, a bowling round or a tower defense variant with added rules or restrictions. It keeps the game play fresh and makes you wonder what’s next. Jetpack Joyride is one of the many “endless runner” titles. Your character simply runs to the right, and your job is to avoid obstacles by tapping the screen to jump (or in this case activate the jet pack). I usually hate these sort of games, because they get old very quickly. Since there is no way to save progress and the game is designed to make you die and start over a lot, you end up running through the same beginning section of the game all the time – it becomes tedious and pointless after a while. Jetpack Joyride creators were aware of this, and they built their game around this concept. The backdrops for your runs and obstacle/powerup placements are randomized so that no two runs look or feel the same. Furthermore, the game does not focus on how far can you get but what you do as you run. The game basically gives you achievement style challenges – like high fiving scientists, surviving set amount of time inside a vehicle, dying at a predefined spot, flying really close to obstacles and etc. You get actual rewards for these tasks, whereas there is no rewards for distance (it’s just good for bragging rights). As a result, 90% of the time you don’t care about your distance, or the fact you just died because you are trying to achieve one of these goals – alleviating a lot of frustration involved with these sort of games. As you can see there is more to it than just running. The coins you collect can be spent in the in-game store to purchase items such as new jetpacks, or power-ups (like Air-Barrys sneakers that give you a jump ability which lifts you into the air faster than the jetpack). It also involves a slot machine mechanic that makes it possible to win extra power-ups, coins, or even bring you back to life and let you continue running. The sheer amount of available items, bonuses and power-ups, combined with the fun and varied challenge system gives this game an incredible re-play value. Even though you keep doing the same things, it does not get old for a while. Another nice thing is that while the game is a freemium title, it really does not try to force you to purchase anything. All the rewards can be earned through game-play and while you can buy coins for real world money, the game does not try to force that option on you. 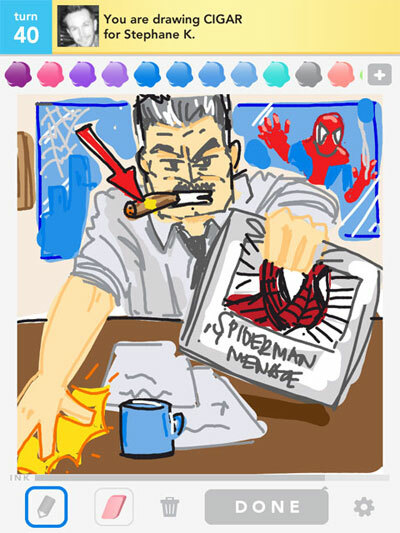 Draw Something is just about the only one of the “social” type games I enjoy these days. I guess it’s because it fosters creativity. It is essentially a variant on pictionary – you draw something, and the other person must guess it. It is really best played against someone you know so you can both laugh at the crude stick figure drawings you make, or give each other props when you come up with a clever way to draw some difficult word. It also helps that both players share the same frame of reference, know the same memes and like similar things. It is a great fun little way to share inside jokes and such. Playing with strangers (while possible through the in-game player matching feature) does not have the same appeal. Guessing correctly earns you coins which can be redeemed for additional colors for your color palette, or bombs that let you swap out words, or destroy letters making your guessing easier. Its not much, but I think the replay value stems from the social interaction between you and the other players rather than from the built in reward system. I like that the game is quite open ended and gives a lot of control to the player. It is entirely possible to cheat by simply just spelling out the words, but hardly anyone ever does. And I guess that says something. I think these are the key design items for phone games. What sort of games do you like? Am I missing some really good games? Is your list of things you look for in a phone game different from mine? Let me know in the comments. This entry was posted in video games and tagged iPhone. Bookmark the permalink. fwiw I’ve been playing ‘Junk Jack’ (on iphone) a lot these days.. its a sandbox style mining/crafting game. Call it 2d minecraft. Lotsa fun. another i’ve liked is Super Crate Box… a really simple platformer. Collect as many boxes as you can before you die, everytime you get a new box, you get a new random weapon, forcing you to change strategies. 100 Rogues is a pretty nifty roguelike. not as cool as nethack, but probably as good as it can get on an iphone screen. Junk Jack looks a lot like Terraria – like disturbingly close. If Terraria was backed by a big dev studio there’d be lawsuits I think. Looks kinda cool though. So does the crate thing and the Rogue thing. I will check them out. Luke, what’s your Draw Something username? I think we qualify as ‘like minded’ enough to play. yikes.. Junk Jack DOES look alot like terraria, never seen that one. I’ve tried both of those nethack ports, and while pretty cool, i found the controls too awkward to play all that often. ALSO.. thanks for the dungeon raid rec. perfect for wasting time at work today. As far as time wasting games, I’ve recently (past three days) been playing drawsomething, I find it quite addictive, although I’ve only really played against a couple of people I know, all of whom are not exactly gifted with an artistic bent. That said neither am I – good fun though. I’ve played words with friends, another social game that can last for days, but not too bad. I like jetpack joyride, did all the challenges 3 times then got a little bored of it. Angry birds – passed the time, but got old quite quick for me. I did find ‘the impossible game’ quite addictive for a while – worth looking at. The main one I’ve played is Crossfingers! it’s a simple slide wooden blocks around, but I found it a great time waster!! As for android games, I don’t really play anything on my phone. oh, another game I liked on the ipad…. Space chem – bit of a mind f**k, but fun none the less. @ mcai8sh4: They have SpaceChem for the iPad?!? Holy crap- I’m going to pick that up as soon as my iPad comes in. That game is QUALITY. Dungeon Raid looks really nice (if spending some minutes of free time is the goal). The one I’ve been sinking time in was Pirates & Traders (pretty much like the old Pirates back when the first was new). Then the author-mentioned-as-inspiration StarTraders. Even more time sink-value but not really useable for short play. And then there was the “humblebundle for android” and it gave me canabalt. Yepp, the Canabalt where you run from something and jump from house to house while the city around you is destroyed and which was originally a browsergame. There’s a great game called Osmos HD. Very cool – you start as a small microbe, eating smaller microbes. As you do, you get bigger. Sounds dull, but isn’t. As for most games, I hate the push notifications and social networking lack of privacy of most of them – which is why I refuse to play Draw Something. Install AppBrain Ad to check the issues with games and other apps. I just got Osmos HD for my android phone, and it’s nearly as good as the pc version. Holy cow – entering text into this field from my phone is just about impossible. Let’s try this instead. I’ve been playing Draw Something on my phone since the Penny-Arcade comic about the game brought it to my attention. It’s good, but there need to be more things that you can spend coins on, and way more words. I see the same things come up over and over, and it’s boring. Another big problem with the game is the number of great drawings I’ve lost when I have a poor connection. Seems to me that one could code around that issue. Air Control is a fun plane-landing game that I’ve had on my phone for a long time and still play. Casual and fun. Ditto Plants vs zombies, which I’ve played start-to-finish twice on my PC, and which my daughter now plays on the iPad. Probably my all-time favorite Android game is Gem Miner. The original, not Gem Miner 2. Dig tunnels, mine coal, iron, silver, etc., buy upgrades, dig deeper. It’s fun for the same reason Dungeon Keeper was – you dig paths and define the structure yourself. Dungeon Scroll is an Android game wherein you make words to fight monsters in a dungeon. I keep going back to that one. I also play Androminion, the android version of the card game Dominion. Playing the game looks like you’re using a terminal screen, but it’s very functional. These are Android games, but I think only Air Attack isn’t on iOS. These are the four games that are always on my phone and tablet and I don’t get bored of. Legends of Yore is worth a look, simple roguelike that can be played in short bursts. I second the Dungeon Raid votes. Air Attack by Wedo Games (there was a web/java version somewhere at one point).